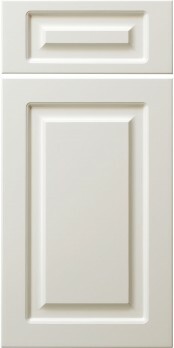 The 10RC is a routed MDF (Medium Density Fiberboard) door, which is a great option for painted kitchens. Using an asymmetrical routed design (see cross-section below), this door appears to have both a framing bead profile and panel raise profile, when in reality it is a solid one-piece door. Note: inside corner of routed detail are not square, they are radiused. For squared corners, consider the SQ series of MDF doors.